Magnet advertising is kicking dust in the large barren land of marketing and it is slowly gathering audience with its sticking power. Magnet itself is a loved item and human fascination with this item never ends. This blog discusses five reasons why 7×9 magnets may work for your campaign. These findings are largely applicable to other advertising magnets above 7×9. No doubt, you would agree on it, too. Customized 7×9 magnets are large and no one can ignore them. These customized magnets can be sought for positioning your regular and special business information and are perfect for building sales flyers, postcards, posters and more. Personalized 7×9 magnets would look great over refrigerator doors and car doors due to their large size. When used as a car magnet, it may not attract attention from long distances, but it is good enough to influence those quality prospects seeing it from close quarters. These promotional magnets would look brilliant with full color printing. Free full color printing is offered by online eCommerce stores stocking made in USA magnets. 7×9 is excellent dimension and offers large room for experimentation. You can use it for positioning your business information and individual complements. This means you can exercise, capitalize, and position your mind over these advertising magnets. This point is very valid for magnet advertising because this is the only form of advertising, which allows investor to take control of the campaign. You can design the campaign the way you want without bothering about losing control or overspending. Personalized magnets 9 x7 magnets make perfect giveaway during tradeshows and promotional events. People would be happier to receive a purposeful promotional magnet, which they can retain over their refrigerator doors or working cabinets. If you have carefully noticed promotional gifts given over years, you would notice that advertisers used to splurge on small cost to high cost items such as caps, pens, notepads, to jewelry and perfumes for attracting their customers. The main drawback with most of these items was that they had limited influence due to their restricted purpose and people rarely used them after a certain point of time.However, with personalized magnets, you can remain confident that people are going to use them forever. They are going to use it for decorating their refrigerator door or car door and see them the each single day. Doesn’t that sound amazing! 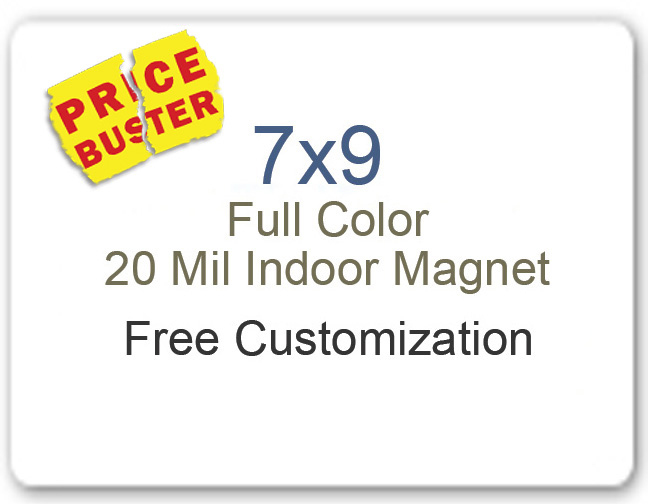 Customized 7×9 magnets offer large room for positioning emotions and expressions. You can use them for building calendar magnets, printing business flyers, sending holiday wishes, crafting fundraiser magnets, and more. People would be happier to receive a full color magnet acknowledging their efforts or influencing their buying decisions. By aggregating the ideas collected from above mentioned points, it can be confirmed that personalized 7 x9 magnets are going to be perfect for carrying myriad of expressions and impressions that may influence a viewer.